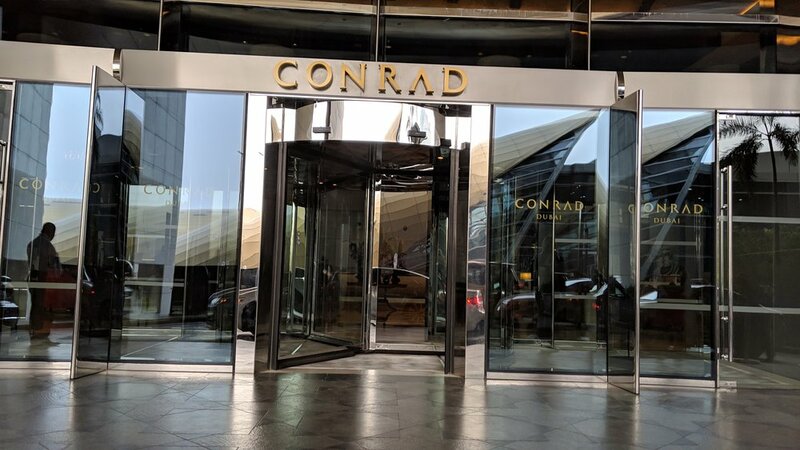 The Conrad Dubai was a great, luxury hotel that comes with all the style, service, and elegance you would expect from the Conrad brand. The hotel is spacious, well equipped, and has wonderful service. The location is great for Expo or World Trade Center visitors. It’s comfortable, but a bit out of the way from some of the tourist destinations if that’s what you’re after. tl;dr: The hotel is great if you’ll be in that area or are particularly a fan of the Conrad brand hotels. 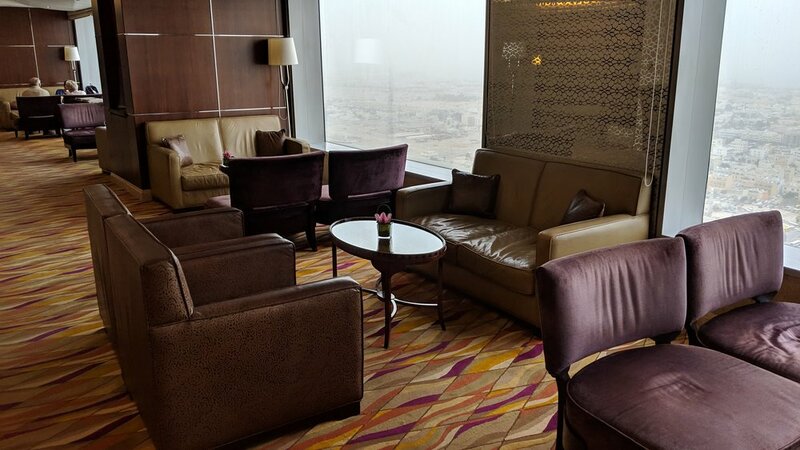 It’s not a total budget buster for Dubai and has can be redeemed for Hilton points (42,000). See TripAdvisor Reviews. The Conrad Dubai is another stunning example of the modern luxury of the Conrad brand. The hotel has a large and beautiful lobby for easy check in from the curb. 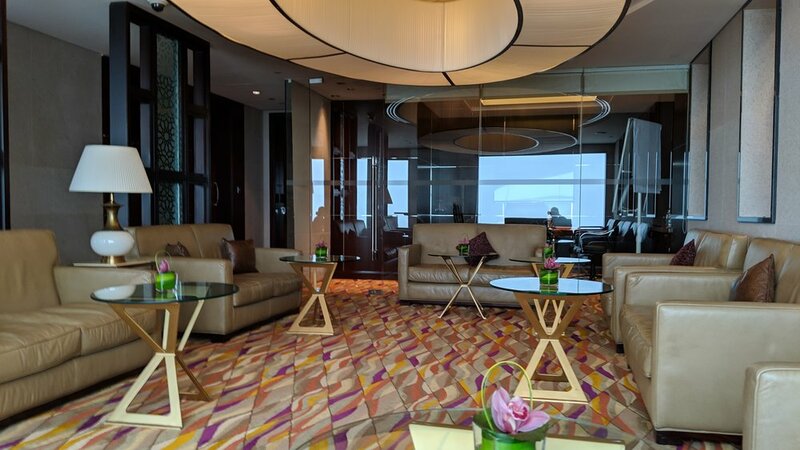 Or, if you’re an elite member, you have the option of going up to the lounge area for a check in there instead. The main elevators are in the back, behind the check in counter, but the hotel is quite impressive at entry. Front entrance by the car pick up / drop off area. We got upgraded to a Deluxe King Room Suite upon arrival from our Hilton Diamond status. The room was huge. It was well laid out and had plenty of seating areas. This is entry way you first enter into. The door on the left is the external door to leave the room. Directly behind the camera is the living room area. Off to the right is a hallway to the rest of the suite (photo later, below) and straight ahead is a kitchen area we actually didn’t realize until later was part of the room. We forgot to photograph it we were so surprised, but it had a small fridge (empty), sink, and plenty of cabinets and dishes. The main living room of the suite had plenty of room to work, relax, and hang out. They were even nice enough to give us a few items to eat in the room when we arrived, including a birthday cake since we were staying here for my birthday! And of course, the mini-bar. Plenty of snacks and glasses with the mini-bar. To get to the rest of the suite you continue past the entry way down this main hall. The master bathroom and bedroom are the door on the right about midway down. There is also a second bathroom at the end of the hall on the right. The door to the left at the end of the hall was a connecting door to an adjoining suite. About half way down the first hall way on the right a door opens to this hallway to the master bathroom and bedroom. There is plenty of closet and storage on the left. The first door on the left is the master bathroom. At the end of the hall is the bedroom. Which then connected to the master bathroom. Given the size of the suite the master bathroom was actually rather tight and will definitely be a challenge if you have two people getting ready at the same time. The sink was fine, though a little small. On the left was the shower and on the right was the toilet and bidet. Large shower with rainfall shower head. And the soap / shampoo / conditioner you’ll get. Conrad has been changing these out (this is the newer one) but my wife was a big fan of the old ones and was a bit disappointed to see these ones. Past the closets and the master bathroom you’ll find the bedroom. Which then opens up into the bedroom. The bed was a good size, but a little hard for my tastes. There was also a Bose clock radio next to the bed on the night stand. There was a nice vanity on the other side of the room. The TV was nice, but mounted to the wall directly which made it hard to hook up our Fire Stick (though we got it eventually). This was a panel next to the bed that controlled the curtains, the lights, and the signs by the room entrance for Do Not Disturb and House Keeping. The thermostat also had handy buttons to turn on or off the Do Not Disturb or House Keeping lights that function as a sign out by the door at the entrance to the room. At the far end of the hallway by the entry there was also a second (half) bathroom. This was the smaller half bath at the end of the hall. Simple, but useful. We had room service and breakfast at the hotel in the main restaurant. The room service was a bit expensive, but was surprisingly good. It also had a pretty wide menu, so there’s probably something you’ll be interested on the menu. The breakfast left a bit to be desired. The spread was large and impressive and includes things like an omelet station, which is great. The overall quality of the food though was just ok. It really wasn’t the best, though, and definitely on the low end of the Conrad breakfasts we’ve experienced at other hotels. The Conrad also has a great lounge. You can get access with elite status or by upgrading to the Deluxe rooms. There was plenty of free food, drinks, and you can even enjoy breakfast here. The lounge is on the 24th floor through this door near the elevator. The lounge opens into an entry area with desks and staff. Elite members can check in here instead of in the lobby if you prefer. There’s also plenty of food and drinks available. A wide variety of food. They have different items out each night and include separate items for Tea time and happy hour. It’s quite spacious and there’s plenty of seating. They also had a spa that looked beautiful, but we didn’t partake of it this time. And then there was the fitness center. 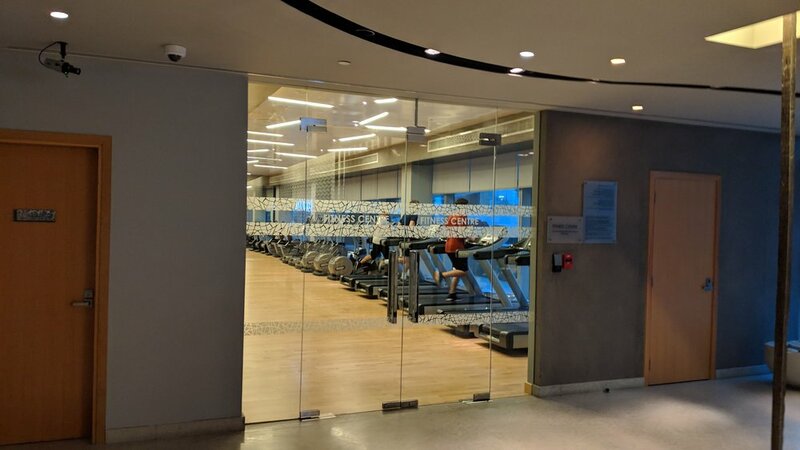 The fitness center was hidden away inside the Spa. Just go in the SPA and it’s down on the left. 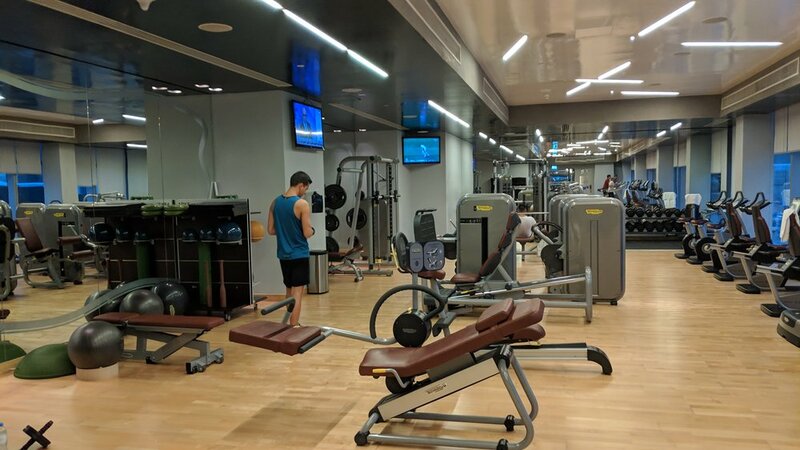 It’s actually a pretty nice fitness center though. Several treadmills all in good condition. Plenty of other cardio equipment if you prefer. And other equipment all well maintained and in good condition. 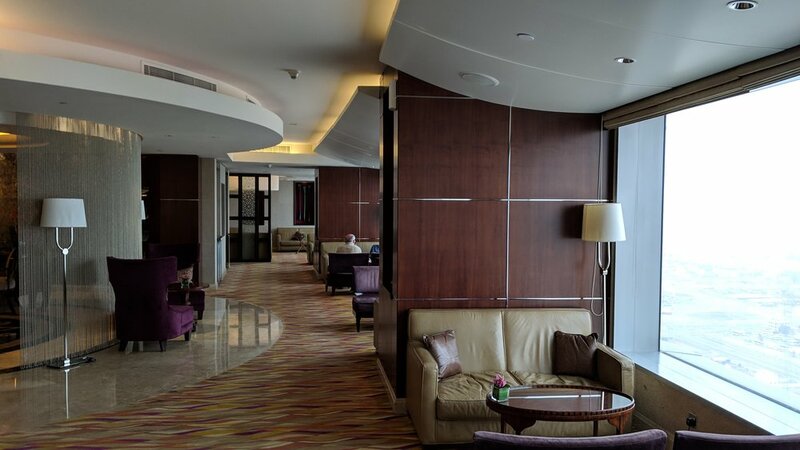 The hotel is very close to the Dubai World Trade Centre and some of the other convention centers in the area. If you’re visiting for one of those it’s a great choice. There is also a very convenient metro stop just outside of the hotel. The hotel is a bit far away from some of the malls and other tourist sites, however. And there wasn’t as much food in this area as there are in other parts of town. All in it’s not bad, but might not be ideal if you’re just here for sightseeing. i actually worked for a couple days while we were staying here and was able to do video and audio calls without any problems. We also streamed several shows on Netflix and generally had a great experience with it. It was actually extremely reliable and didn’t have any annoying device limits or kick me off every 24 hours or some of the other annoyances I’ve run into from other hotel internet in the past. I’d definitely recommend it if you need a place to stay and crank through some work or video calls. The service at the hotel was great. Check in and check out were fast and smooth. We were always greeted warmly by the staff. The staff in the lounge was also always friendly, helpful, and pleasant. Housekeeping was also wonderful. They had the attention to detail you hope for that kept the room spotless and were fast. 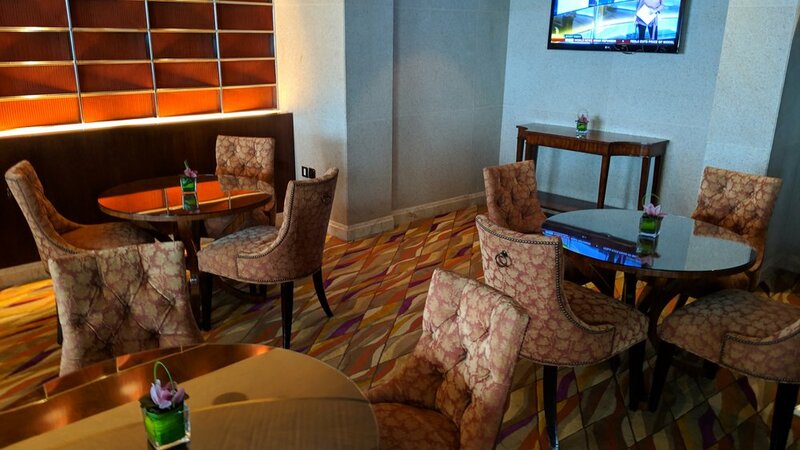 It’s also worth mentioning one of my favorite features of Conrad hotels, which is the Conrad Concierge app. The app lets you request house keeping services at a specific time, as well as pillows, soap, towels, and other items on demand. In some cases you can even view menus and order in room dining. It’s a very handy way to get items when you’d rather not call or can’t. For example, we’ve used it to request house keeping at a specific time while we’re out if we forgot to before leaving the hotel. Useful when you have a short time out to grab a meal or something. 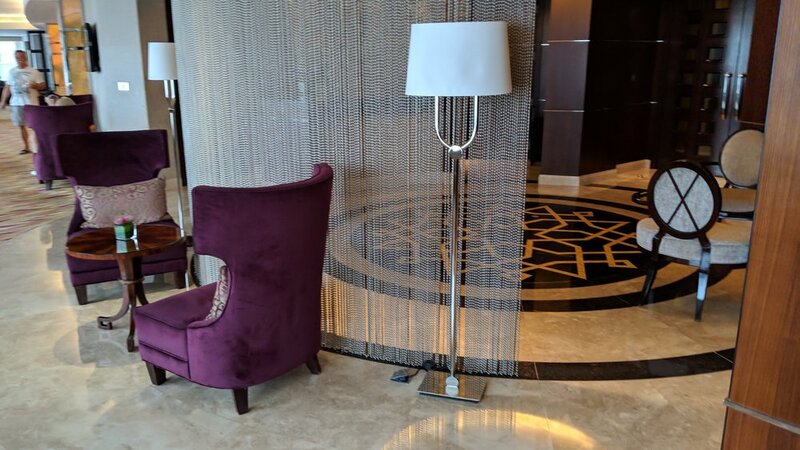 The Conrad Dubai is a great hotel and definitely worth a stay. In particular if you’ll be going to a conference or convention nearby. The food, service, and internet are all great and it’s a wonderful spot to get some work done or just enjoy the great city. It’s one downside is the location isn’t great for site-seeing. I also thought the bed was a little hard and the bathroom was an odd layout that made it hard for my wife and I to get ready at the same time. 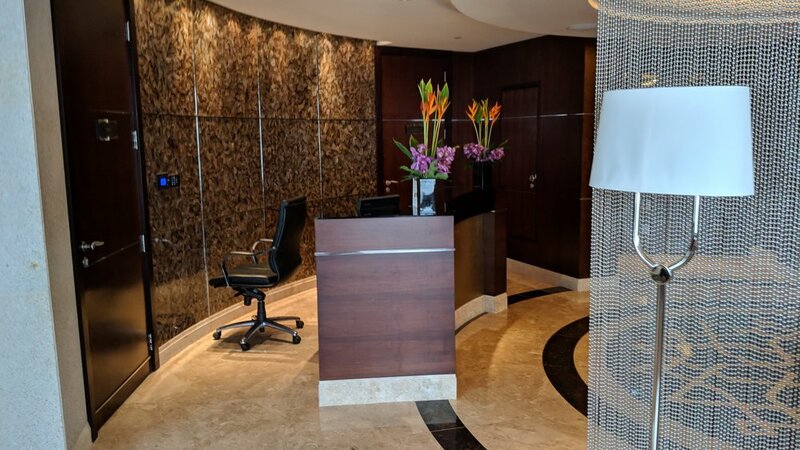 However, all in it’s a great stay and a good option if you’re a Hilton loyalist and / or have some Hilton points to burn when visiting Dubai. This site is for entertainment purposes only. The owners and authors of this site are not legal or tax professionals nor financial planners, and articles here are of an opinion and general nature and should not be relied upon for individual circumstances. Some links on this page may contain an affilaite code and earn an affiliate commision. This does not impact our review and / or placement of any products. Copyright © 2019 Roam Connected, LLC. All rights reserved.